So on this last day of 2016, I take a few moments to look back on the year and try to project what lies ahead for 2017.
Business wise, it was a good year. Not a great year. But a good year. I worked with a variety of new clients, lost an established one and still maintain ties with a long-time relationship which is very rewarding. 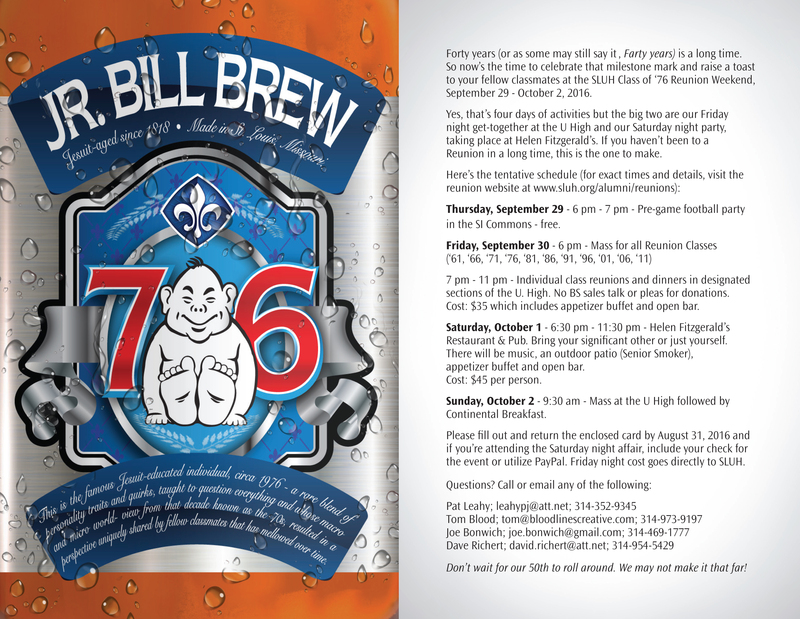 Though not a paying ciient, the invite that I created for our SLUH 40th Year Reunion was great fun and so was the Reunion weekend. On the art side of things, I was happy with the progress I’ve made as a painter. 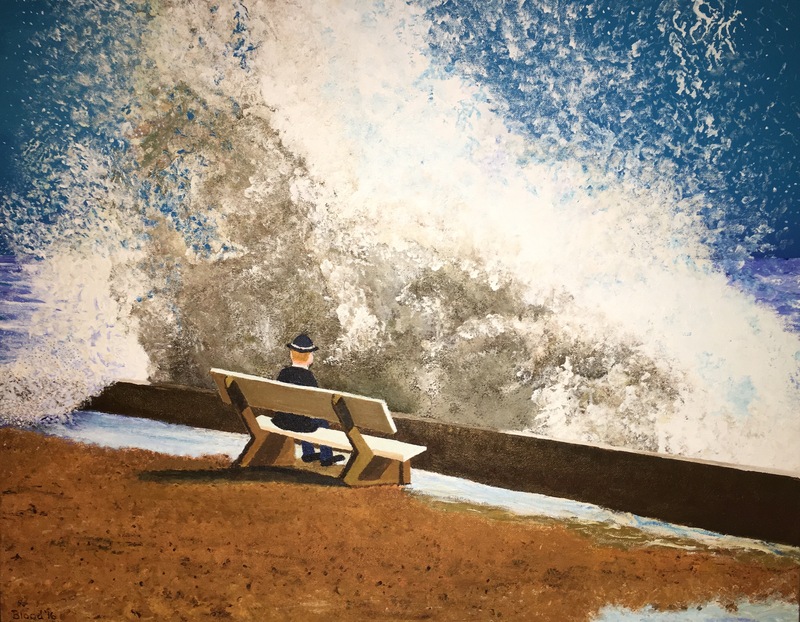 I created 11 paintings in 2016 – I don’t exactly churn them out, but I do stay at it and I continue to try and improve my brushwork, executing a variety of ideas that come from all places but always seem to circle back to Magritte in one way or another. This painting was probably my favorite one that I created in 2016. It will be one of more than 30 on display at a solo show coming up in March. The first site looks nice but has basically been useless due to a lack of promotion on my part. 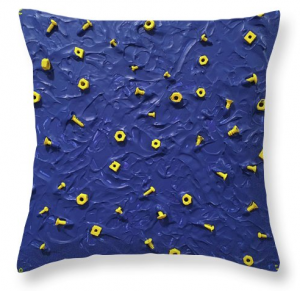 The second site enables you to take your art and have it show up in the form of pillows, tote bags, iPhone covers, coffee mugs, greeting cards and a variety of ways to order prints. That site continues to draw about 25-50 visitors a day and I’m approaching more than 8000 views since I started it back in July. The sales effort though has been somewhat disappointing – I’ve made enough to pay for the site but that’s about it. 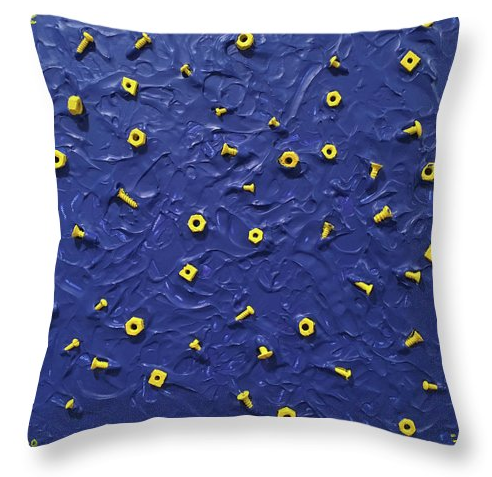 Nuts and Bolts – one of my ‘stick’ paintings looks really cool in the form of a pillow and I’ve sold a few of them in 2016. There are more than a million works of art on the website. So I’m not overly surprised that my work isn’t selling like gangbusters. I don’t do art for a living. I do it for fun. I do it because I can. And I will continue to try and get better with each painting. Prospects for 2017 look solid for both BloodLines Creative and BloodLines Art. Currently, I have a number of projects already in the books, some that will be on-going thru the Spring. I’m hoping to have my website fully optimized by the end of January and then I’ll begin more aggressive new business pursuits. I hope to ramp up my blogging efforts in 2017 and have them be more focused on advertising and art. I dropped off the blogosphere and I’ve lost a lot of regular readers. Hopefully, I can earn them back. I’m going to be ramping up for my first solo art show since 1994 over the next two months. 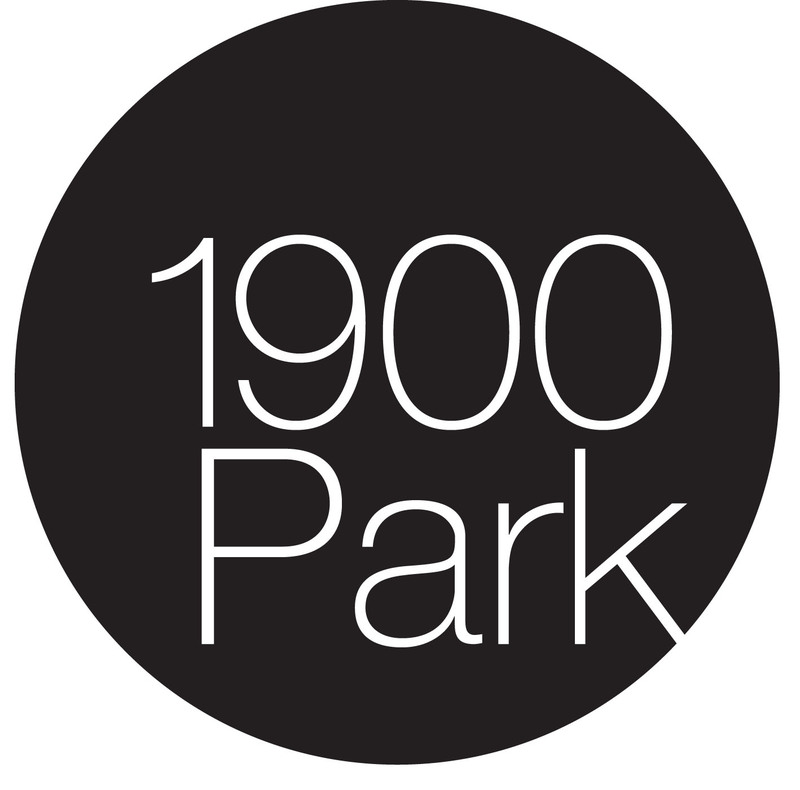 It’s going to be at 1900 Park – Creative Space and Gallery. It’s both an art gallery and a music venue which will be awesome as I’ll have more than 30 works on display throughout the month of March. Opening night is going to be on Friday, March 3 and feature the music of Tom Blood, Jr.
More on that will be coming. 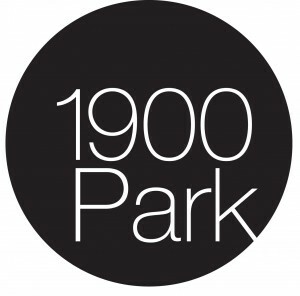 1900 Park will be the site of my first solo art show since 1994. Opening night will be on Friday, March 3rd. I have learned in this business that you never know what’s around the corner. You do your best, try your hardest, be honest with the people you work with and have fun in the process and generally, good things will happen. I have been blessed to work with so many gifted individuals through the years. I continue to learn and explore new ways to market – but bottom line, whether you’re doing a website or online ads or developing a trade show booth, you still need big ideas to stand out, get noticed and acted upon. I’ve still got a lot of those. Happy New Year and I’ll see you on the other side of 2017. The Los Angeles Rams are not the worst team in the NFL – though I imagine that if they played Cleveland home, away or in Stan’s Emirates Stadium in London that the Browns would somehow manage to come out on top – maybe by like a 5-2 score. 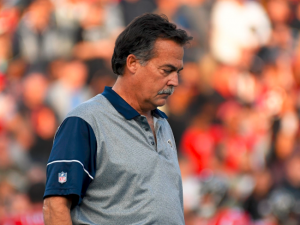 Jeff Fisher has the chance to go into the record books as the coach with the most losses in NFL history. With Stan Kroenke’s backing, he should easily take the record to new heights (or lows). Even though they’re not the worst, they will soon have the coach who has been on the sidelines of more losses than any other coach in the history of the game. That is quite a distinction and certainly worthy of a 2-year contract extension to assure that Jeff Fisher manages to firmly cement his name at the top of the list as the biggest NFL loser of all time. Stan Kroenke is certainly astute enough to know that when he’s this close to a record, he’s got to go for the gusto and with their band of Merry Pranksters, they should be able to virtually guarantee another two years of ineptitude to really rack up Jeff’s loss total to unapproachable levels. The Rams are already irrelevant in Los Angeles. They rank in the bottom tier of TV ratings for NFL cities overall. Other NFL games not involving the Rams have drawn more viewers in La-La land than Rams games multiple times this season. The amount of empty seats is more prevalent in L.A. than it was here. Today’s slaughter was witnessed by 53,979 brave souls, most of whom were probably stuck in traffic somewhere by the time the 4th quarter rolled around. That’s almost 40,000 no-shows. Why would they? Jeff Fisher is getting about $7 million a year to lead the charge of this pitiful product. Stan is in the midst of constructing a new NFL palace that also will have attached retail and living arrangements and he owns all the land. He is not someone I would want as a landlord (just ask the hundreds of people on the Waggoner Ranch down in Texas). Once the stadium is built and the area is developed, Stan will be rolling in even more riches – provided of course, that the city of Los Angeles doesn’t demand that the Rams leave and stop shaming their city. 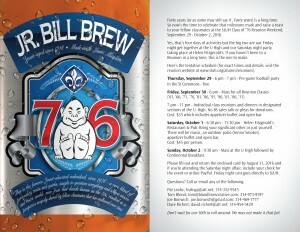 It’s all kind of comical to watch and I know I’m not the only St. Louisan attuned to their failure. Personally, I’m hoping that Stan tears up that two-year deal and instead, signs Jeff to a lifetime contract so that the Rams can continue to go on to 4-12 or 5-11 seasons into infinity. So congratulations, once again to Jeff Fisher. I’ll be pulling for you to break the record this Thursday night on national TV. The Seahawks should be more than motivated to help you make history.